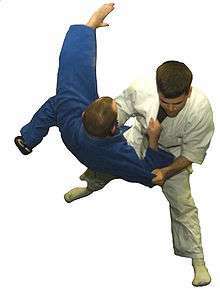 Ordinarily, the development of combative techniques is intertwined with the tools used to execute those techniques. In a rapidly changing world, those tools are constantly changing, requiring that the techniques to use them be continuously reinvented. The history of Japan is somewhat unique in its relative isolation. Compared with the rest of the world, the Japanese tools of war evolved slowly. Many people believe that this afforded the warrior class the opportunity to study their weapons with greater depth than other cultures. Nevertheless, the teaching and training of these martial arts did evolve. 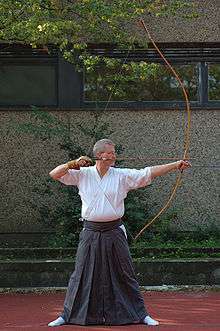 For example, in the early medieval period, the bow and the spear were emphasized, but during the Tokugawa period, fewer large scale battles took place, and the sword became the most prestigious weapon. Another trend that developed throughout Japanese history was that of increasing martial specialization as society became more stratified over time. Sumo (相撲:すもう, sumō), considered by many to be Japan's national sport, has its origins in the distant past. The earliest written records of Japan, which are dated from the 8th century AD, record the first sumo match in 23 BC, occurring specifically at the request of the emperor and continuing until one man was too wounded to continue. Beginning in 728 AD, the emperor Shōmu Tennō (聖武 天皇, 701–756) began holding official sumo matches at the annual harvest festivals. This tradition of having matches in the presence of the emperor continued, but gradually spread, with matches also held at Shinto festivals, and sumo training was eventually incorporated into military training. By the 17th century, sumo was an organized professional sport, open to the public, enjoyed by both the upper class and commoners. Ninjutsu was developed by groups of people mainly from the Iga Province and Kōka, Shiga of Japan who became noted for their skills as assassins, scouts and spies. The training of these shinobi (ninja) can involve disguise, escape, concealment, archery, medicine, explosives, and poisons. Mostly developed in the 14th century during the warring states period of feudal Japan, many different schools (ryū) have taught their unique versions of the art. Karate practice is primarily characterized by linear punching and kicking techniques executed from a stable, fixed stance. 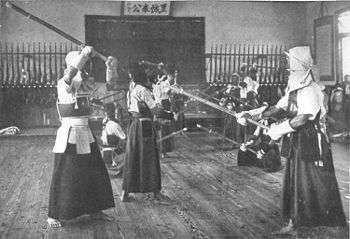 Many styles of karate practiced today incorporate the forms (kata) originally developed by Funakoshi and his teachers and many different weapons originally used as farm implements by the peasants of Okinawa. Many karate practitioners also participate in light- and no-contact competitions while some (ex. kyokushin karate) still compete in full-contact competitions with little or no protective gear. A code of honor for samurai way of life, in principle similar to chivalry but culturally very different. 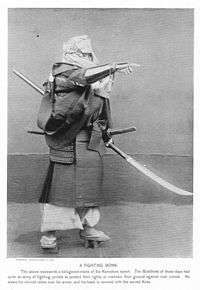 Literally "the way of the warrior", those dedicated to Bushido have exemplary skill with a sword or bow, and can withstand great pain and discomfort. 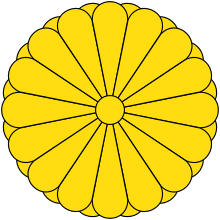 It emphasizes courage, bravery, and loyalty to their lord (daimyo) above all. There are ultimately two systems of education in the Japanese martial arts, although some schools have been known to blend these two systems together. The old education system prior 1868 was based on a curriculum in order to preserved the tradition. The curriculum is organized by a very few series of level that would be passed down within the Ryu (tradition). 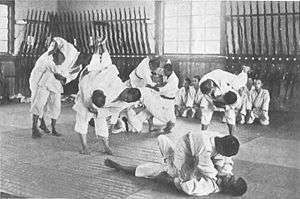 The curriculum would culminate in the student achieving a "license of total transmission" (menkyo kaiden), which was a license permitting the student to teach the ryu's tradition outside of the ryu. The modern system after 1868 (dan'i) awards belts in accordance with students reaching a particular rank. Students progress by promotion through a series of "grades" (kyū), followed by a series of "degrees" (dan), pursuant to formal testing procedures. Some arts use only white and black belts to distinguish between skill levels, while others use a progression of colored belts for kyū levels. ↑ Green, Thomas. Martial Arts of the World: Encyclopedia. pp. 56–58. ISBN 978-1576071502. 1 2 Mol, Serge (2001). Classical Fighting Arts of Japan: A Complete Guide to Koryū Jūjutsu. Tokyo, Japan: Kodansha International, Ltd. p. 69. ISBN 4-7700-2619-6. ↑ Oscar Ratti; Adele Westbrook (15 July 1991). Secrets of the Samurai: The Martial Arts of Feudal Japan. Tuttle Publishing. ISBN 978-0-8048-1684-7. Retrieved 11 September 2012. ↑ Skoss, Diane (2006-05-09). "A Koryu Primer". Koryu Books. Retrieved 2007-01-01. ↑ Warner, Gordon; Draeger, Donn F. (2005). Japanese Swordsmanship. Weatherhill. pp. 8–9. ISBN 0-8348-0236-8. ↑ "World Shorinji Kempo Organization". World Shorinji Kempo Organization. World Shorinji Kempo Organization. Retrieved 29 July 2012. ↑ Ribner, Susan; Richard Chin (1978). The Martial Arts. New York: Harper & Row. p. 95. ISBN 0-06-024999-4. ↑ Morgan, Diane (2001). The Best Guide to Eastern Philosophy and Religion. New York: Renaissance Books. p. 38. ↑ Shigeru, Egami (1976). The Heart of Karate-Do. Tokyo: Kodansha International. p. 17. ISBN 0-87011-816-1. ↑ Hyams, Joe (1979). Zen in the Martial Arts. New York, NY: Penguin Putnam, Inc. p. 58. ISBN 0-87477-101-3. 1 2 Lowry, Dave. "Sen (Taking the Initiative)". 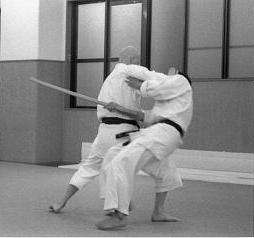 ↑ Jones, Todd D. "Angular Attack Theory: An Aikido Perspective". Aikido Journal. 1 2 3 Pranin, Stanley (2007). 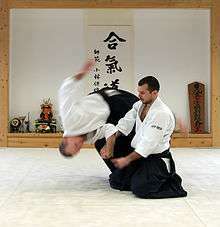 "Exploring the Founder's Aikido". Aikido Journal. Retrieved 2007-07-25. ↑ Lowry, Dave (1984). "Senpai and Kohai (Seniors and Juniors)". Karate Illustrated.